Hundreds of California State University, Northridge freshmen attended the Freshman Convocation, an annual event that formally welcomes first-year students to CSUN. 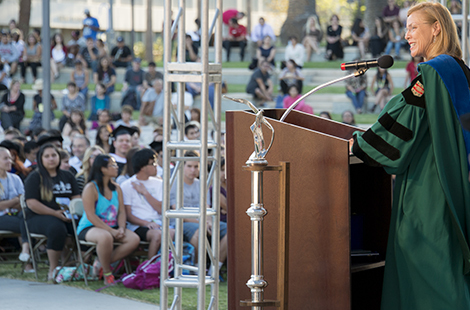 Read more about convocation. Claire White is fulfilling her interdisciplinary interest as the first-ever professorship in the cognitive science of religion in North America. Read more about the cognitive science of religion. As technology and education increasingly merge, CSUN continues to be a leader in providing new mobility services for students. Read more about the app. Tue., Sept. 16, 11:30 a.m.
Fri., Sept. 19, 7 p.m. Sat., Sept. 20, 6:30 p.m.
Open Enrollment is the opportune time for Benefits Eligible Employees to evaluate current benefits and review what makes the most sense for you and your family going forward. Any changes made take effect Jan. 1, 2015. Brigid Schulte writes about work-life issues and seeking to understand what it takes to live “the good life” across race, class and gender. CSUN faculty and staff are invited to become members of the award-winning Student Recreation Center.